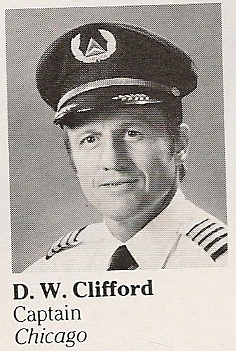 Notification with the passing of retired DL pilot and Delta Golden Wings member Captain David Warren Clifford, age 73. Captain Clifford hired on with Delta Air Lines 10-03-1966 and was based Chicago for most of his career, then CVG/030 prior to retirement. DAVID WARREN CLIFFORD, 73 COLUMBIA, Mo. 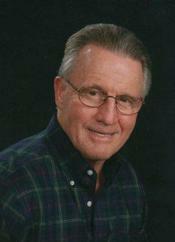 - David Warren Clifford, 73, of Columbia, Mo., passed away August 8, 2013 at the Mexico Missouri Veterans Home. He was born October 12, 1939 in Rockland, Maine to the late Richard and Anna (Smith) Clifford Greene. Dave was blessed with a great sense of adventure and encouraged that in others. Competition, whether as part of a sports team or as an individual, was always part of his life. At the age of 9, the family moved from Dave's beloved Maine to Maywood, Ill. He attended Proviso High School and competed in football, basketball and baseball. A sports scholarship enabled Dave to attend DePauw University in Greencastle, Ind., where he competed all four years in football and baseball. He was a member of the Delta Kappa Epsilon fraternity. He worked waiting tables at the Alpha Gamma Delta Sorority house where he met his wife, Jean McCalister. Following their graduations, they were married December 28, 1961, and enjoyed 51 years together. March 1962 David entered the United States Marine Corps as a 2nd Lieutenant based at NAS Pensacola for flight training and earning his wings as a Naval Aviator at Kingsville, Tex. At MCAS Cherry Point, N.C., he flew A-4's with Marine Attack Squadron 332. He then finished his active USMC service at NAS Pensacola as an instructor. At the completion of active duty, Dave remained in the Marine Corps reserves flying out of NAS Glenview in Illinois. Dave worked for Delta Air Lines for 30 years flying the DC-9 and Boeing 727 out of O'Hare Field in Chicago. Dave was a line check pilot on the DC-9. He served with the Air Line Pilots Association as Captain Representative and Council #43 Chairman for the Delta pilots based at O'Hare from 1988 to 1992. While living in Palatine, Ill., Dave was an active father to his two children, Dan and Elizabeth (Betsy). He served the Palatine Presbyterian Church as Sunday school teacher, Elder, and leader for 10 years in the Jr. High or Sr. High youth groups. He ran many miles with the Palatine High School cross country team as a volunteer. This led to his competition in local road races even completing two Boston Marathons and two Chicago Marathons. In the winter Dave cross country skied, again competing in area races including the 55K American Birkebeiner in Hayward, Wis., for many years. Dave was active in the founding of the Buehler YMCA in Palatine, Ill., serving on the board of directors from 1970 to 1977. In 1971 Dave was selected as the Jaycee "man of the year" by receiving their Distinguished Service Award. After 19 years in Palatine, Dave and Jean moved as "empty nester" to Lake Summerset, Ill. Here Dave could continue to pursue his sports and competitive interests always encouraging others as he went. He sailed, biked, kayaked, golfed, ice skated while continuing to run and cross country ski. He loved to sail and would captain trips to the British Virgin Islands with family and friends. After retirement, in October 1996, Jean and Dave traveled for two years in their fifth-wheel recreation vehicle visiting the lower 48 United States and nine Canadian providences. In November 2004 Dave became an incomplete paraplegic due to severe spinal stenosis. This did not stop his determination. He excelled at rehab even being honored by one of his physical therapists receiving that year's outstanding patient award. Dave's love of sports and competition continued as he biked many miles and raced his Invacare 27-speed handcycle. He completed 3 marathons racing with Achilles International in the Palm Beach, the Miami, and the Ft. Lauderdale marathons. Dave and Jean moved to Columbia, Mo., in 2006 where he was a member of the Community United Methodist Church and participated in the choir for several years. He enjoyed attending his grandchildren's sports events and the Tiger Quarterback Club. When Alzheimer's Disease took over, Dave was fortunate to attend The Adult Day Connection for a year before moving to the Mexico Missouri Veterans Home where he again received loving care. Dave is survived by his wife, Jean; son, Dan (Lisa) of Hoffman Estates, Ill.; and daughter, Betsy (Jon) Oursler of Columbia, Mo. ; He was also the proud grandfather of six, Ricky, Nikki, and Ben Clifford of Hoffman Estates, and Paige, Keri, and Jeffrey Oursler of Columbia; two brothers, Bill ( Nancy ) of Lake Bluff, Ill., and Paul ( Alice ) of Romeoville, Ill.; and sister-in-law, Jo Ann McCalister of Goffstown, N.H. He was preceded in death by his parents; his sister, Sylvia Kunreuther; and an infant son, Douglas William.